Bartacks and Singletrack: Straw Boater Project: Cruising at a very ambitious altitude. 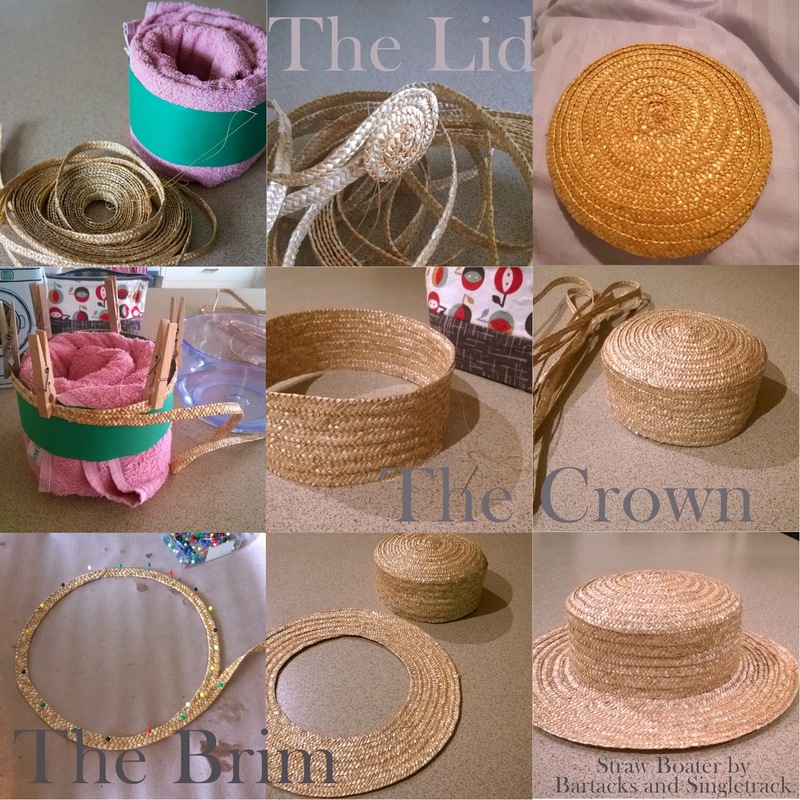 Straw Boater Project: Cruising at a very ambitious altitude. Everything that is except the hat. You already know what I did about that, right?! 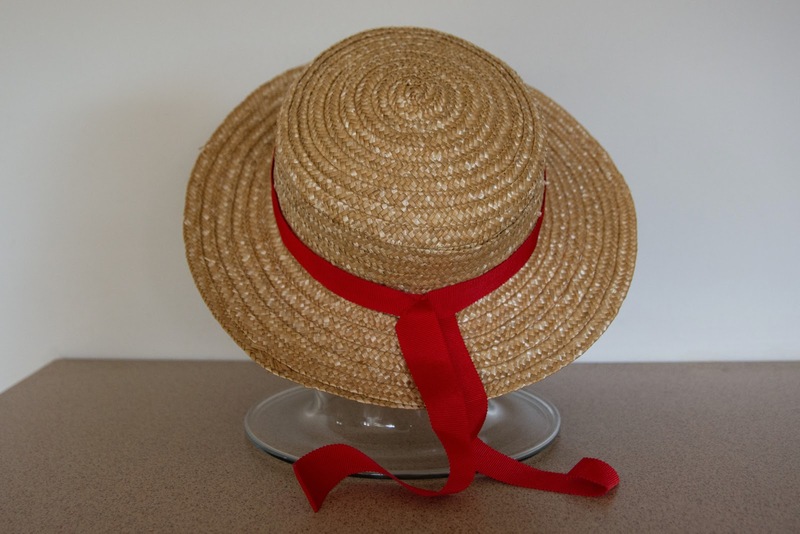 I'd never made a straw hat before, but I figured a boater would have to be the easiest to start with. It's all right angles and I imagined I would make the three sections and then join them together. Sounded simple in my head. To her credit, Nina, who took my call, was probably not used to this kind of brazen ambition from a complete novice. But I was coming off the back of my first-ever-beading-project-blue-ribbon and in my head I could imagine what I was going to do. She packaged up 10metres of 10mm wide wheat braid and some red grosgrain ribbon and sent it to me express post for next day delivery. Of course, I foolishly sat on it for 48 hours while finishing my Kid's Clothes Week sewing, and then began the weekend of the Straw Boater Project. The advice that I had from Nina was that the straw braid could be brittle and I needed to wet it to shape it. The bit that I figured out for myself was that the best way to prevent those F^*%ng twisty knots in the thread was to run the lengths along a tealight candle in order to wax them. It didn't entirely prevent the knots and there was a fair bit of tugging knots through, some occasionally successful unpicking of knots, and plenty of language of which a genteel boater wearer would not approve. I realised, perhaps a bit too late, that the lid should not be perfectly round, so started overlapping the braid at the sides more to give it an oval shape. I kept going round and round until the lid was the same size as my green cardboard hat. The crown was probably the easiest part. Using the green hat as a size guide I pegged out the first round and then stitched until it was deep enough. While the kids rode their bikes at the skate park on Sunday, I sewed. The lid went on top and was stitched in place, at which point it looked a lot like I should be steaming dumplings in it. As an aside, this project was probably the most pleasant smelling thing I've ever sewn. I must have been a horse or a goat in another life! By the time I was ready to start the brim it was Monday afternoon and the kids were going to swimming. In order to sew the brim without having to hold the crown, I marked the outline of the crown on paper and then pinned the braid to the markings to begin my brim. Once I had the first stitches in place it became fixed in diameter and portable. I sewed furiously while they swam. It was the best location of the weekend as a quick dunk in the pool was all the wheat braid needed to stay supple. Finally, a very late night stint lasting well into Tuesday morning had the brim attached, the Petersham ribbon sewn in (that's the bit where I wished I owned a thimble) and the ribbon on the outside. In what must be a glorious hatters version of a hole in one, Nina's estimate of 10m of braid was EXACTLY what was required. There was not even a centimetre to trim off and nothing was missing for lack of more straw. She obviously really knows her stuff! As she had every reason to doubt that I did, she had sent about 3m extra for free just in case. There might come a time when I've forgotten just how much work this was and end up making a miniature one for P's teddy. Thank you so much to everyone who followed my progress on Flickr or Facebook. Your encouragement was everything to me. It was a long, long weekend and I honestly may have lost the plot if not for the "ping" of my phone telling me that someone else "got" what I was doing. You'd be horrified if you knew this kid's history with losing school hats. His track record is appalling. I'm delighted to say, that after seeing his mum toil all weekend, he was very mindful that if the hat didn't come home, neither should he. It did. He had a great day. Thanks Mel. Sometimes not knowing what a project involves is for the best! I think you ought to win a blue ribbon for this hat! Well crafted, well executed and Piers looks like a perfect Venetian. Clever idea on how to attach the brim to the crown .I was wondering how you were going to do that. 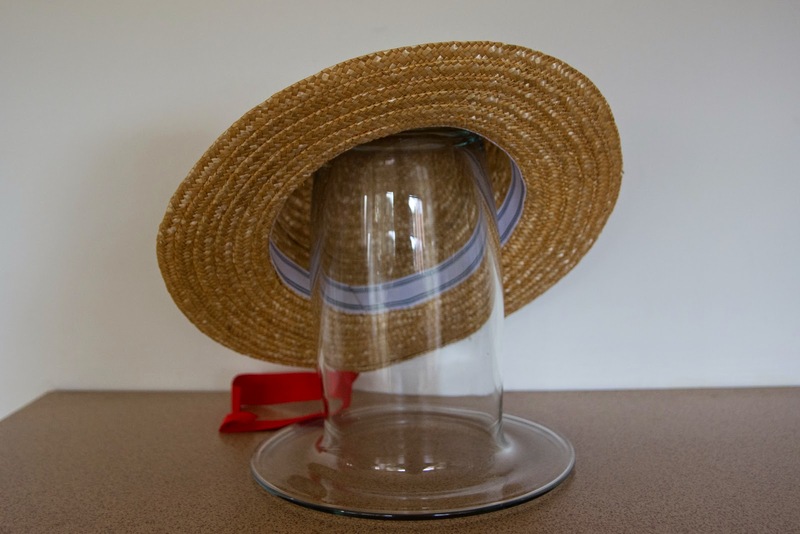 Thanks for the step-by-step details on how to make a straw boater. I was worried the brim might flop down, but it was a perfect little Frisbee and so was happy to stick straight out. I forgot to mention that after I stitched the brim it looked a bit wavy and did curve downwards a little so I put it between two damp tea towels and ironed it. That worked so well, I wish I'd thought to do that to the lid. If it wasn't for the tight deadline this would have been a really enjoyable project. I'd make another straw hat for sure. I just need to plan ahead a bit better! 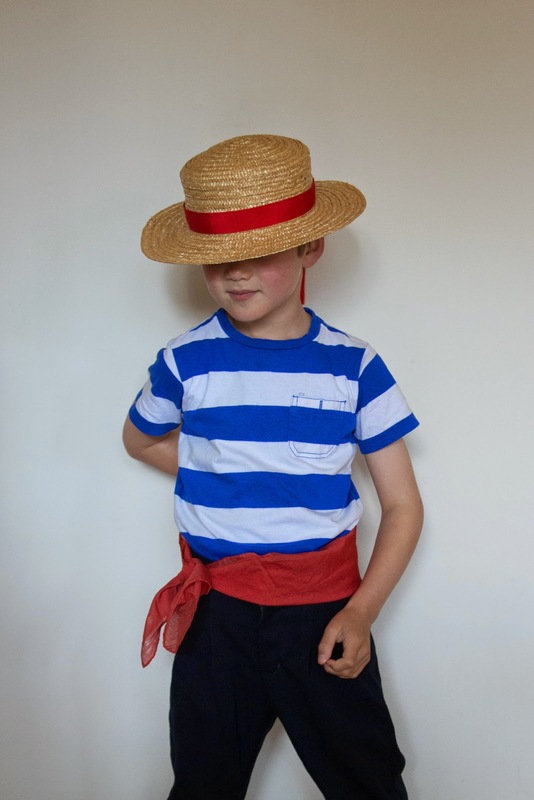 So, I just can't even get over this: When your kid's gondolier costume needed a straw boater hat, your response was, "Hm, I'll just MAKE A STRAW HAT. Sure, I've never made a hat before, but how hard can it be?" I knew I liked you. Awesome. Just awesome. Oh yeah, I'm that dangerous combination of perfectionist (it couldn't be any other type of hat) and recklessly ambitious (no idea what I'm doing) crafter. Good thing it's only a straw hat and not the engineering for a passenger plane or something, huh?! And you are sweet and funny and made my day! thank you. This is... This is... Aaaaaaaaaaaaaaaaaaaaaaaaamazing! Gosh, is there anything you can't do? Glad to hear your boy had a great day and returned home with this awesome hat! Ha ha. Well there are some very shambolic aspects to my life. You won't get any home maintenance, skincare or baking tips on this blog!! Thanks for your lovely comment. I was happy to see how pleased P was with his hat. He had told his teacher that I'd made it, but she had interpreted that to mean I'd put the red ribbon around it. Fair enough misunderstanding, I hardly believed it myself! I wouldn't have even attempted this project. You are truly a superstar. P's school sounds like they have the best theme days. I would have wanted to go to that one! But you know you could do it, don't you?! Often it's the relatively simple, but very time consuming things that come out looking so tricky. Thanks for the kind words. I was fortunate to have a half day at work so I got to be a parent helper at Italian day and it was great! The kids all had a blast. Damn, I was waiting for your skincare tips....seriously, what everyone else said- amazing, ambitious, and crazy all at the same time. Thanks. It's the crazy, ambitious stuff that's the most satisfying. At least when it works, that is. Wow, this is seriously impressive! I had no idea this was even possible! And that last photo is epic, too! I didn't know it was possible either Rachel, until I tried! Thanks. P is right into posing for pictures sometimes. If only we'd had time to learn standing paddleboarding and get some action shots! Cross this one off your sewing bucket list - WOW! You're awesome. It looks perfect. Oh I don't dare make that list, it could get crazy. Anyway, there's only one thing on the mental bucket list, and you know what that is! Thanks for the compliments, I'm really quite pleased with it too! The outfit came together so nicely. And that hat...I'm seriously impressed! Thanks Cindy, it's nice when almost everything you need is already in the wardrobe. Extra nice when the ambitious hat gamble pays off! Are you kidding? That's amazing! Thanks Liesl. You know how much fun it is to get carried away, couturier to King Carlos IV and all! This tsunami of confidence I'm riding on all started with your sewing patterns. So, many thanks. Just looking at all the work you did makes my head and my fingers hurt! This is amazing!!! You did such an great job with the entire outfit. Thank you Irene. 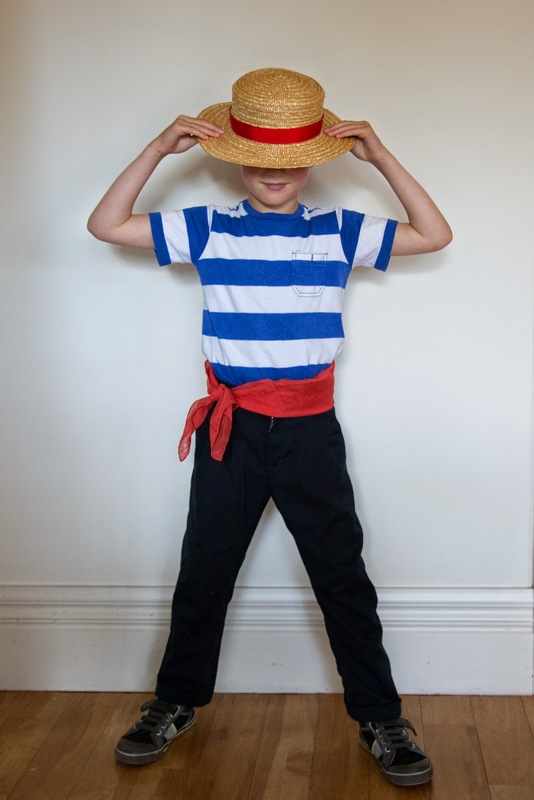 Apart from the hat it was easy: School uniform Banyan pants, a T-shirt gifted by granny and a scarf from the dress ups box. 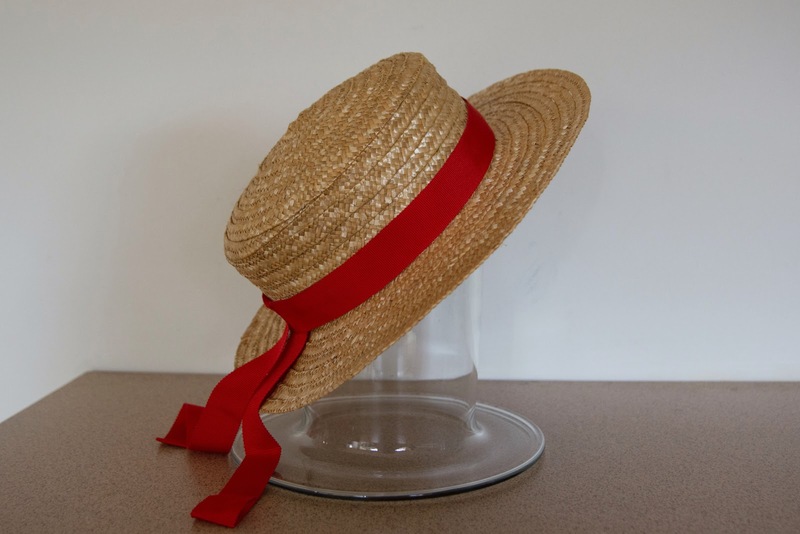 The hat sewing was really very pleasant, when it's damp the straw braid is very pliable and it truly does smell so good!